Paperight has won the Digital Minds Innovation Award at the London Book Fair – one of the world’s most prestigious publishing events. The showcase was held Sunday night at the Digital Minds Conference, a precursor event to the London Book Fair, where dozens of illustrious speakers from around the publishing world speculate and postulate about evolution, innovation and disruption in the publishing industry. Keynote speakers included authors Neil Gaiman and Robert Levine, as well as Will Atkinson, Sales and Marketing Director at Faber & Faber. Paperight beat out seven other shortlisted candidates after a short presentation in front of an audience of hundreds of the world’s publishing thought leaders, and won thanks to a popular vote. 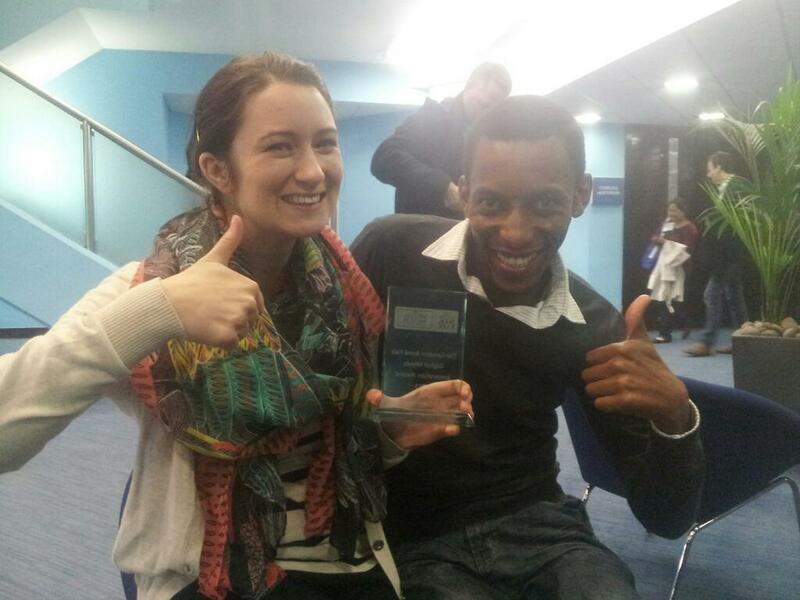 Content manager Tarryn-Anne Anderson and content curator Oscar Masinyana show off our latest piece of silverware. The win comes on the back of Paperight’s win at a similar innovation showcase at the O’Reilly Tools of Change conference in New York City in February, and a seed grant from the SAB Foundation as part of their Innovation Awards. Unlike Paperight’s win at the O’Reilly Tools of Change Startup Showcase, however, where Paperight was the only shortlisted innovation from outside Europe and North America, this time Paperight also beat stiff competition from the Middle East.